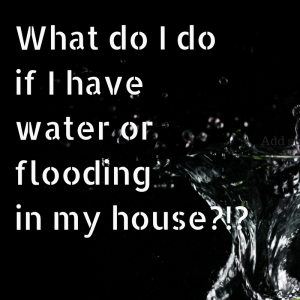 What Do I Do if I Have Water or Flooding in My House? Electrocution is the number one cause for deaths after floods have occurred. 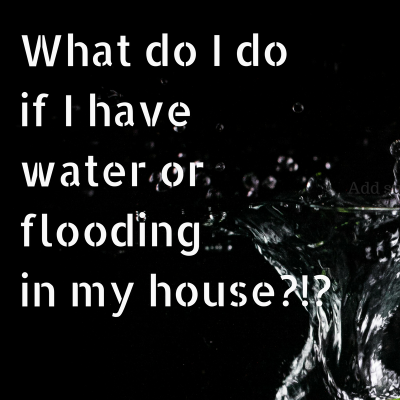 We understand that everyone intellectually knows that water and electricity don’t mix but when we see water in our basement and panic sets in – we don’t always think straight. It’s easy to forget about all of the electronics plugged in which are exposed to water causing a potentially lethal current. And, we most certainly don’t think of the electrical outlets being filled with water since we probably can’t see them. Just to drive this point further home, keep in mind that drywall can wick moisture away from the floor and up the wall so just because you think it’s just a little water, doesn’t mean you’re safe to go exploring around. Carpets become like sponges and laminate flooring can be hiding water underneath them so looks can very much be deceiving. Resist the temptation “to just check things out.” Don’t ever step into standing water even if you think it’s just a little bit. Don’t allow any members of your family to be the “hero”. It’s simply not worth it. Call 911 for help. Once the electricity to your home is off, then call certified professionals.